Karli Dinardo photographed by Sean Higgins. Karli Dinardo is presently performing in 'Hamilton: an American Musical'. She is one of 10 dancers who have spoken exclusively to 'Dance Australia' about their full-time studies experience for our 2018 Full-Time Studies Guide. I’m from Eltham, Melbourne, though I have been based in NYC for over six years now and also call it home. Where did you undertake your full-time training? I started dancing when I was two years old and moved to Patrick Studios Australia when it first opened at age 13 to be in their first Elite Program. Once I successfully completed my VCE at 17 I moved to NYC to study full time at AMDA [American Musical and Dramatic Academy] in their Integrated Conservatory Program in Musical Theatre. Was it a big change to move into fulltime studies? Absolutely. Moving away from family and all you’re familiar with to the other side of the world is huge. It tests you in every single area of your life, and yet was one of the most incredible journeys I have been fortunate enough to embark on. I have always been academic while also juggling long hours and high standards at PSA, yet still the hours in College were longer, more intense and demanding. Not to mention being in the most competitive city for musical theatre! Everyone is amazing, everyone is hustling and trying to “make it” in their own way. I learnt so much from that alone because no one is going to do the work for you -- it’s completely on you. School exposed me to a wealth of knowledge about the industry and about our craft, how our instrument is invaluable and -- just like a musical instrument -- needs to be tended to, cared for and fine tuned often. I gained a more enriched respect for musical theatre's history which became a foundation for better understanding the American way for performers. It definitely lent itself to “my working life” in America. How quickly did you gain employment? In my final semester of college I threw myself into the audition world. The system is completely different to what we have in Oz, but that’s a long story. In those early days standing outside in the snow waiting to write your name down on an open call non-Equity audition list at 6am was normal. Sometimes you got seen and many times you didn’t. It definitely wasn’t easy. Often it’s not just about talent, it’s about being in the right place at the right time and having all the jigsaw pieces fit together. Perseverance prevailed and I booked my first show right before I graduated. The show was to start a couple months later. I’m very grateful to have been working consistently since, diving into completely different styles of shows (Alex Owens in Flashdance, the Musical, Anita in West Side Story, Graziella in West Side Story at Carnegie Hall, 42nd Street, to name a few), getting what I needed to obtain my O1 visa and then shortly after that my Green Card. Tell us a little about your present job. I’m currently on tour with Hamilton: an American Musical, and have been since it began in January 2017 as Dance Captain, Swing and Understudy to Peggy Schuyler/Maria Reynolds. To say it has been everything is an understatement on absolutely every level; creatively, professionally and personally. I feel so honoured and humbled to be part of history with this musical as it redefines our industry, breaks moulds, sets new precedents, and profoundly effects all who get to see it. Even after all this time I get choked up at different moments. It’s a theatrical masterpiece, and I feel very lucky to be a part of telling this story around America with an incredible group of people and artists who inspire me daily. As Co-Dance Captain I’m responsible for maintaining the choreography of the show, teaching new cast members or existing cast members various tracks/roles, running rehearsals for swings, understudies and standby’s every week, and kind of have to know the show inside out to know what everyone’s doing throughout -- male and female. As a swing and understudy I cover all five female ensemble members and Peggy/Maria, and can go on for anyone of them at any moment in time. It’s by far the most challenging thing I’ve ever done but it’s also one of the most rewarding as a result. Every day it forces me to test my own strength and push my own boundaries to keep striving for excellence, and I couldn’t be more grateful. 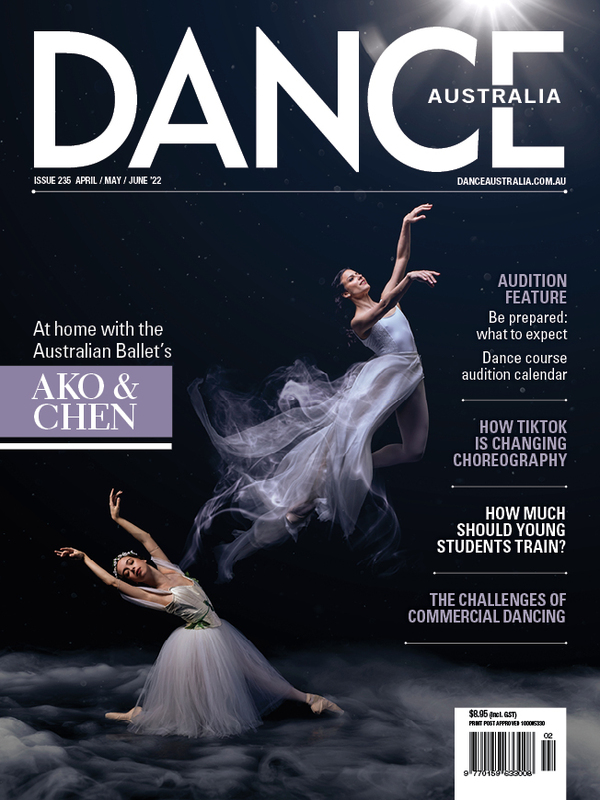 Don't miss our Full-Time Studies Guide - our pull-out, FREE supplement in the June/July issue of Dance Australia. Buy from your favourite retailer or subscribe (at ridiculously low prices) here..